Last fall the city of Albany was one of a handful of municipalities around the country to get a grant from the federal government to start using officer-worn body cameras as a way of providing a more accurate account of interactions between officers and the public. The Albany Police Department recently released a draft version of its policy on the use of the cameras. In short, it would require patrol and Neighborhood Engagement Unit officers to wear the cameras for the entirety of their shift (and detectives when they're on field operations). And it calls for the cameras to be turned on for a wide variety of interactions with the public, from when officers are engaged in traffic stops to pursuits to prisoner transports. It also gives officers the discretion to the turn the cameras on in other situation, such as routine interactions with the public. All video would be saved for 120 days, longer if it's flagged as being relevant to some sort of case or complaint. The draft policy isn't long -- it's posted at that link above and it's also embedded below. One thing that isn't currently spelled out in the policy is a system of non-police review of video from the cameras. There appeared to be strong public support for that sort of review during a previous public meeting about this topic, and chief Brendan Cox said Tuesday evening at the forum at the Albany Public Library Washington Ave branch that the department heard those concerns and it's working out some of the legal details of a proposal. 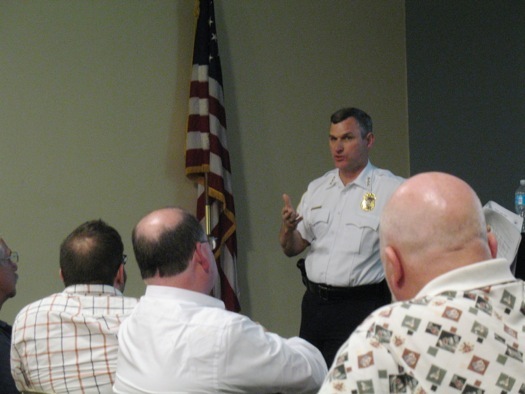 Cox also said Tuesday that the APD is hoping to start testing various body camera systems this July. As mentioned, the city of Albany is getting a grant from the feds to help start the program -- $133,305. That money requires a match from the city, either in cash or in-kind. So the tab here is already going to be at least $250,000. And it sounds like the final cost will be much higher. As Sears said at one point: "It's going to be expensive." Presumably the police department will eventually be turning to city leaders to fund the program. And it'll be interesting to see 1) what the total price tag will be and 2) how willing the mayor and Common Council are to foot the bill, especially considering how financially strapped city seems to be. We go to a lot of public meetings. And sometimes the public turnout for them is... underwhelming. + What safeguards and assurances the department will be able to provide that the video of an incident is actually the whole video and hasn't been edited. (That's when the checksum question came up.) Sears said they're talking with vendors about the various ways of verifying the integrity of video. + And in what wasn't so much a question as a statement, one man raised the issue of how officers might end up directing (if that's the word) video of an incident so that it shows a view that's most favorable to them. He pointed to the belief among some in the community that police currently position dash cams for this purpose. It's always a bit tricky judging whether there's a consensus on a topic at meetings like this one. But from public comments both this week and in February we get the impression that, generally speaking, people are concerned about the cameras not recording enough, rather than recording too much. Here's one example: A member of the public -- Michael Boston -- raised the issue of the recording of juveniles during one of his questions. (He also asked the checksum question above; we talked with him for a few minutes afterward -- he's an IT professional.) An earlier questioner had asked about recording juveniles who were below the criminal age of responsibility, and Cox had indicated the APD would try to be sensitive to the issue. But citing his own experience growing up in Arbor Hill and the South End, Boston questioned whether a policy that leans away from recording situations with juveniles would create a blind spot in monitoring how the department interacts with young people. That question -- and others like it -- get at one of the fundamental issues here: How should people's privacy be balanced against the desire for transparency. There's no easy answer in some situations, but it's good to see that people are thinking about it and asking hard questions about it. So police departments are increasingly becoming... well, not media organizations... but organizations that produce and collect a lot of media. That presents a bunch of technological and administrative challenges. But there's also the issue of who gets access to all that media and how it's used. A recent example: Brendan Cox said Tuesday that the city has recently been working to update its Freedom of Information Law policies for license plate reader data. (These are the systems that use cameras to read license plates on passing cars, check if police are on the lookout for the plates, and log the position.) The goal of the update, he said, was to head off a potential situation in which, say, a domestic abuser could FOIL plate data in order to track the location of a victim. Zooming out a bit, the discussion about police body cameras is another opportunity for the city to think not just about the specifics of this particular piece of equipment, but also about the bigger picture and its overall goals for all this new tech. "The last thing we want to do is ultimately deploy body cameras and do that based just on technology driving it. We need to drive what we're doing," Cox said to the media after Tuesday's meeting. 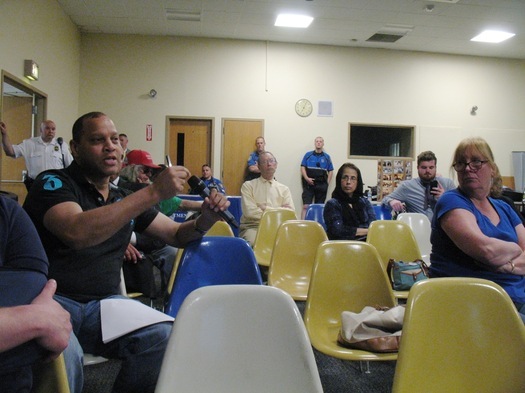 "So we want to make sure we have a strong policy, that that policy is a reflection of not only what the police department wants but the community wants. So that way, as we get the technology, we make sure that it works for what we need." Cox later said that the department has learned from past experience of adding tech -- such as red light cameras -- that it's important for the city to know what it wants and then have technology vendors pitch how they can help the city meet those goals. 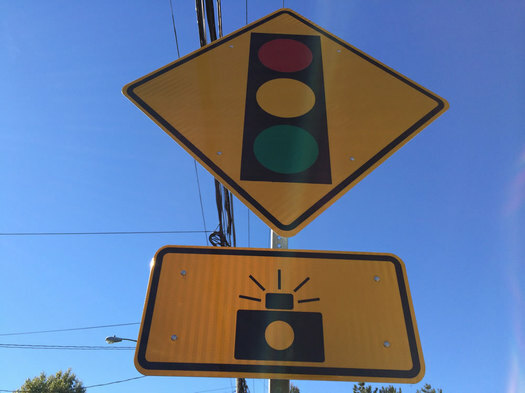 "We definitely learned that what [vendors] say and what they can show at the end of the day are two totally different things," he said in reference to the red light camera experience. "But it's worth putting the time and effort to doing a lot of the stuff ourselves, with the community involved. So that way we have that transparency. And it's not like, 'Who determined to put that camera up?' We determined to put the camera up, not someone else." Both Cox and Robert Sears said this past Tuesday that the APD's policies for body cameras are almost certain to evolve as the department gains experience with them, a lesson learned by departments in other cities that have been using the cameras. And they both stressed a desire to get input from the public. 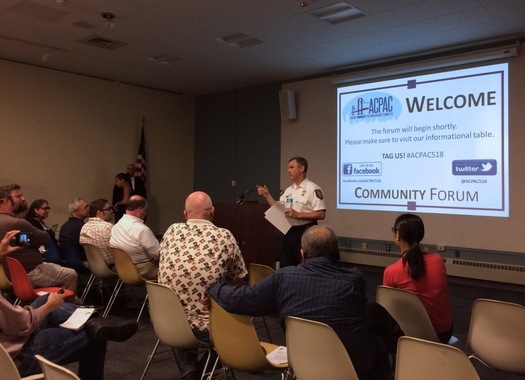 Toward that goal, the department has set up a website about the issue where it will be collecting input in a blog-comment format, and they encouraged people at the meeting to use that site to express their opinions. Also: Prompted by a question from the public, Cox said the department will try to bring some of the body camera tech to a future public meeting so people can get a look at it and better understand how it works. + An org called the Police Executive Research Forum has put together a report looking at the experiences of police departments with body cameras, and offering some recommendations based on what it found. Albany police chief Brendan Cox has said in the past that the APD has been drawing on that report as it sorts through the issues. + The think tank Data & Society published thought-provoking primer on police body cameras. If you'd like a quick-read version, a few of the authors wrote an article -- "It's Not Too Late to Get Body Cameras Right" -- for The Atlantic.